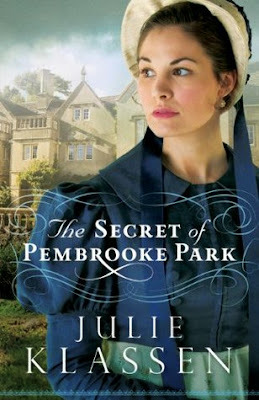 Julie Klassen's books are the only regency Christian Fiction novels I ever read. I am not particularly fond of the genre - sometimes the plot drags on - but I never give up hope with this author. Every time one of her books come out, I read it with as much enthusiasm as I can find, hoping I would love the book. There are only two books of hers I enjoyed with all my heart, but none of her books were bad, and always had some interesting plot twist or another. The Secret of Pembrooke Park was the same way. Usually when the storyline of a book goes on slowly, I am hesitant to finish the book, and instead speed through other novels. With this book, it was not like that. Maybe it was because I was reading the book as a physical copy rather than an ebook, or maybe the cover was just too pretty to resist for too long, but no matter what, I kept coming back to the novel. It did take me a long time to read by my standards - a week - but there was never a moment that I remember disliking the novel; it actually did pretty well in keeping me intrigued considering I have a bad history with slow stories. Personally, I thought that this book had less "Christian" in it than other books. I did not mind that too much, but I will say I would have been happier if God had played a bigger part in the story. Besides that though, the plot had a bit of a The Girl With the Dragon Tattoo feel to it, and that is definitely a plus. There was murder and scandal, even hidden treasure, and the big reveal at the end is something I would not have guessed at even if my life had depended on it (also a plus!). I also enjoyed the three different love interests - if you can call them that - and being able to figure out what they were about from the very first time I met them. It is always a nice self-esteem booster when I can figure out each guy's intent even before it becomes apparent. The only sad bit of the book is that it was not as amazing as I had hoped it would be. For anyone who has read some of Klassen's other books, I had expected this to be a little something like The Tutor's Daughter. Still, if I was being honest with myself, part of the reason I did not enjoy this novel as much as the other is because the main love interest was too nice. It is common knowledge that in books, I prefer the roguish man compared to Mr. Nice, so that may be a legit reason I was not head over heels for this book. Even without that aspect, however, the very plot of the story impressed me greatly, and more than anything, it was the unexpectedness of the mystery's conclusion that makes me respect the book so much. Genuine fans of inspirational regency and mystery may want to take a look at this novel, since it seems to be up a similar alley. For the genre, this is a great book, but I would not go out of my way to recommend it to people who do not usually read similar categories of books. Book Synopsis: Abigail Foster fears she will end up a spinster, especially as she has little dowry to improve her charms and the one man she thought might marry her--a longtime friend--has fallen for her younger, prettier sister. Source: A copy was received from Bethany House Publishers for review.